I’ve read some wonderful posts and comments recently on this topic (see below). It makes for a thought provoking and imaginative discussion. I belong to a few groups on Flickr who do not allow any SL screenshots and I’ve listened to some angry diatribes as to how Second Life images have taken over Flickr groups. I admit the number of SL groups on Flickr is quite prodigious, but a few of them like Blue Moon Gallery and Kultivate Magazine will take both virtual and RL shots and I post to both. So for those who know me as the Dune Mouse on The Runes of the Gatekeeper’s Daughter and the few who might know me from one of the virtual galleries..
Art imitates life? A woodland in SL and one out back of my rl home. what constitutes art? I love portraits and was quite pleased with my virtual “bean sidhe” Aiobhill, on left which was picked as “image of the day” on the Kultivate Magazine Blog. Many virtual artists and sculptors have a brilliant eye for light and design and often use the platform in more abstract ways to present concepts and ideas,whether social, spiritual or psychological. Below is a virtual image from my story The Siren’s Bones (using a real girl in an sl setting), and the beautiful and fanciful watercolour build by rl artist Ceakay Ballyhoo who brought my “Tales of the Tuatha” to a virtual setting. And, what about the builders! To me they are the true artists and story tellers. I’m paying homage to their talent when I take a “screenshot.” They use the pixel spaces to paint amazing and imaginative landscapes and their animated canvases allow others to enjoy and create stories of their own. And thus the progression through time, of storytelling, literature, art and movies culminates now in immersive virtual theater. 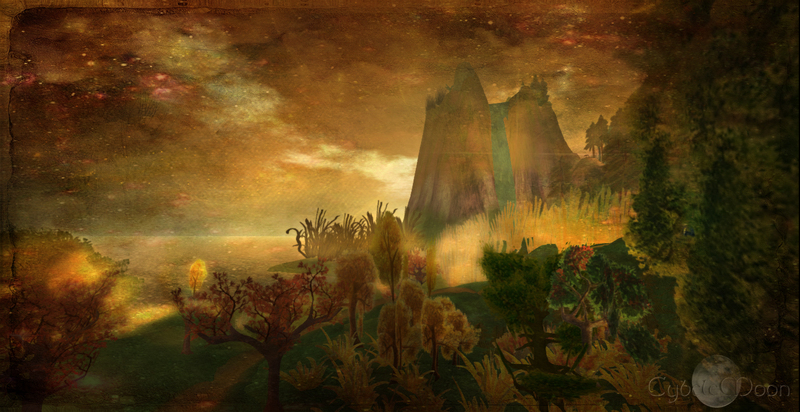 I love the storytelling aspect of the virtual world and the fantastical landscapes, though I am old fashioned. I still like the tactile experience of holding a camera and venturing out into a more physical and full sensory event, like climbing old stone steps or feeling the wind on a forest path, which a virtual world cannot give me. Creative editing is a separate project and it matters not where the picture originated. Visions become art and poetry. I applaud the artists of Second Life and other virtual worlds. If an image moves me in any way or provokes a thought, I consider it art. I would have loved to include the work of others but out of respect for copyright do instead check out these great virtual art blogs and the thoughtful discussions and comments. Some of the machinima created by these same artists is amazing. Wonderful post and topic, Cybele! I also enjoy taking pics and walking about in both worlds, virtual and real. They may be different, but in some ways they are not, as you pointed out. And people like you who so creatively and giftedly combine the two in your pictures show that things intertwine in more ways than one. thanks so much Ck!! I thought you might relate to it!! oh yes!! I will have to read one of your stories! and it was a thrill to see someone else interpret one of my stories in the virtual wold. To me in my mind whether real life or virtual world, art is art. It’s an expression of our imagination no matter how we illustrate it. THANK YOU to The Dune Mouse for this blog! I am very pleased you liked it and took the time to comment Amanda! and big thanks for the reblog! Keep a good discussion going! that is so sweet of you Shey! Thanks. It’s a fascinating topic and one where I’m relatively new- but it appeals to my fantasy side for sure! You are absolutely right! Art is not only bound to RL. There are so much artists in Second life with brilliant eyes for a setup, light, shadows. You know everywhere are people who take there hobby too serious. I have some RL photographers (and only photographers) as followers in my Flickr as I follow some RL photographers and artists too. If someone is angry about my SL post I don’t post in that group anymore if the ADMIN tells me the SL photos are not wanted in this group. I also respect if they state in the rules they want only RL photos. Some photographers think only a clean RL photo without any Photoshop is art. They are wrong and do not understand what art is. Keep having fun with your photos in RL, SL and mix of both too. Your intention for beautiful art is awesome! thanks so much for commenting Aida!! and for your support!! I have a cousin who believes that a photograph need not be touched up and she takes wonderful landscapes. But as you say, each intention is different. I like to play with images! thanks my friend! I love photo art, they are fantastic artwork. Your photos are super Cybele. So pleased you like them Della!! Thank you! Many thanks Meri!! check out my main blog sometime too. You may like my RL which is often quite ethereal as well lol!! I would love to see that, can you please link me up? 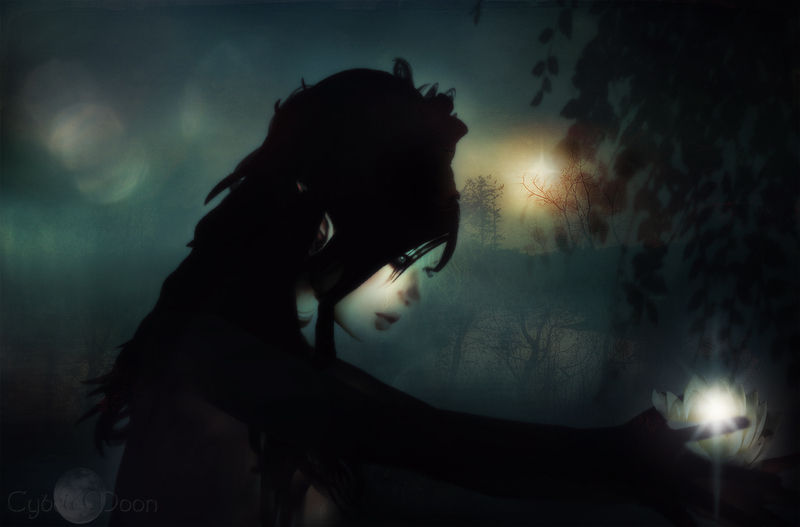 PS: Ceakay Ballyhoo’s SL Sim “Niamhs Dream Journey” is based on one of my stories- “Tales of the Tuatha”. A lovely honour! I do hope you enjoy!! Let me know! Thank you for the article! Love these artworks! Digital photography enable many photographers to be even more creative! Yes! I find them quite imaginative to say the least though I still love my real camera!! its very imaginative stuff! Thanks so much! ha thanks Louise. I see people are being diverted to this site instead of my main one!! I must fix my profile settings. Yes I am in agreement. But it’s the builders of the pixel worlds that deserve credit. Some of them are highly imaginative and I do enjoy exploring them. Such beautiful photographs…. The edition stands out… they are so dreamy!…. Art imitates life… but, also, Life also imitates Art, right! ?-… an interesting Complementary dichotomy, right!?. and you Aquileana! Thank you my dear! !